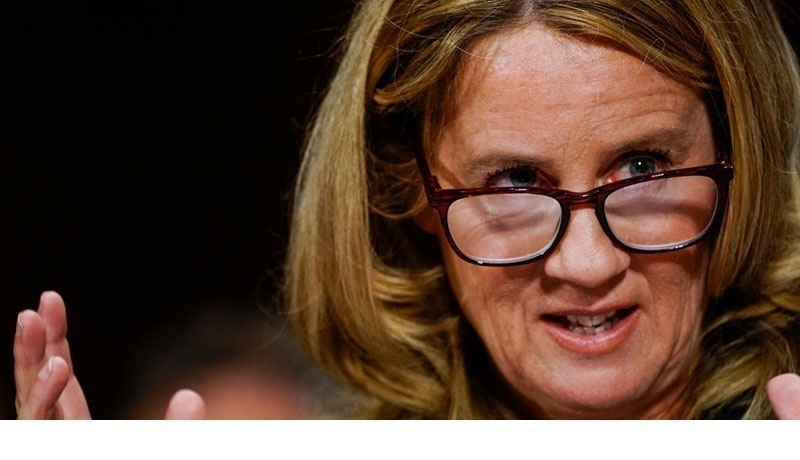 We can also now confirm that Ford is listed as a co-author of a study that carried out mass hypnosis and mind control on psychiatric subjects under the banner of “psychoeducation,” covered in more detail below. The study was published in the Journal of Clinical Psychology. The study title, abstract and authors can be confirmed at this link. …assist in the retrieval of important memories,and create artificial situations that would permit the client to express ego-dystonic emotions in a safe manner. [Subjects] were given the Hypnotic Induction Profile (HIP; H. Spiegel & Spiegel, 2004) to evaluate their level of hypnotizability and were asked to complete a baseline packet of psychosocial questionnaires assessing life events, general functioning, satisfaction with life, and aspects of mood (including symptom levels), personality, health, social support, traumatic experience, and spirituality. Therapist-led groups met once a week in the Department of Psychiatry and Behavioral Sciences at Stanford University School of Medicine to participate in an intervention that included either meditation and yoga exercises or group therapy with formal hypnotic inductions. This study, completed in June of this year (2018), is available at this ScienceDirect link. 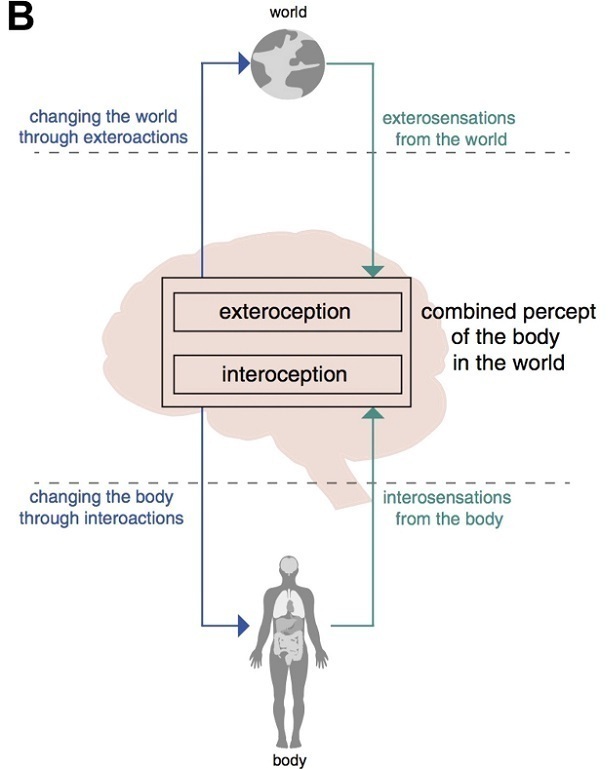 Interoception refers to the process by which the nervous system senses, interprets, and integrates signals originating from within the body, providing a moment-by-moment mapping of the body’s internal landscape across conscious and unconscious levels. In essence, this research seeks to find ways to control the mind through biological interventions by exploiting the “roadmap” of biology / neuro links. When the full map of how the mind interprets internal biological is understood, it allows a kind of reverse engineering of the mind through interventions in the human subject. If this sounds familiar, recall the recent revelations about the projections of inner voices through sub-audible frequencies that can essentially “plant” voices or even emotional moods into the minds of targeted subjects. 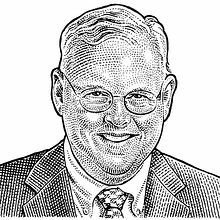 The blaring, grinding noise jolted the American diplomat from his bed in a Havana hotel. He moved just a few feet, and there was silence. He climbed back into bed. Inexplicably, the agonizing sound hit him again. It was as if he’d walked through some invisible wall cutting straight through his room. Soon came the hearing loss, and the speech problems, symptoms both similar and altogether different from others among at least 21 US victims in an astonishing international mystery still unfolding in Cuba. Some felt vibrations, and heard sounds – loud ringing or a high-pitch chirping similar to crickets or cicadas. Other symptoms have included brain swelling, dizziness, nausea, severe headaches, balance problems and tinnitus, or prolonged ringing in the ears. 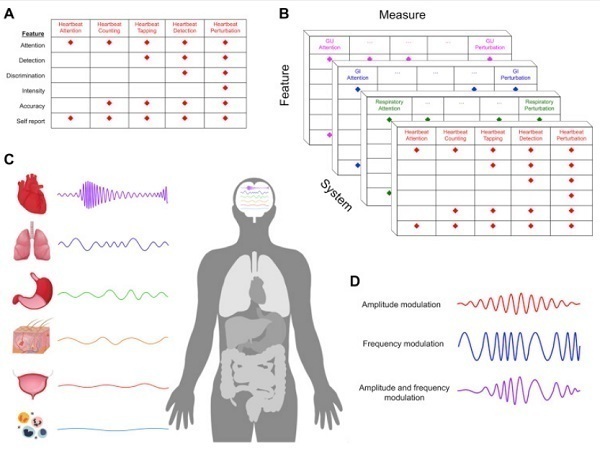 …a host of novel tools are capable of inhibiting, stimulating, or modulating the activity of interoceptive brain networks. Noninvasive methods include the application of transcranial magnetic stimulation (77), transcranial direct and alternating current stimulation (78), low-intensity focused ultrasound (79), temporally interfering electric fields (80), transcutaneous vagus nerve stimulation (81), presentation of information during different phases of visceral rhythms (e.g., cardiac systole vs. diastole) (82), and assessment of corticocardiac signaling (83). We are not alleging any nefarious, unethical or illegal activities on the part of the Mental Insight Foundation. However, to help other internet researchers follow the many leads now uncovered in all this, we’re publishing public information about this foundation that’s readily available in online public tax documents. 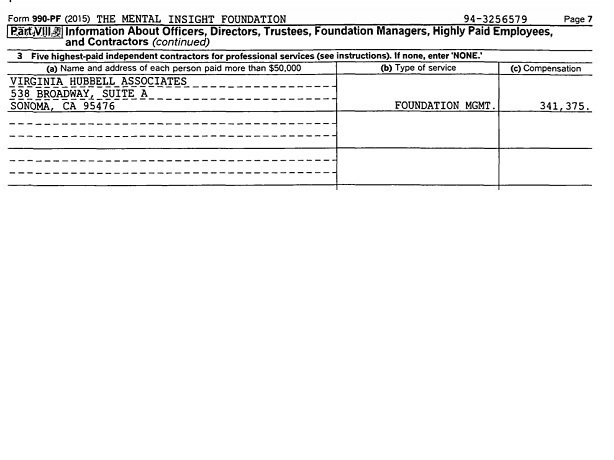 The Mental Insight Foundation took in a whopping $18+ million in 2015, according to tax records. Its address is 538 BROADWAY STE A, SONOMA, CA 95476-6602, which appears to be a single family house. Most of the clients appear to be genuinely helpful organizations for society, but they’re probably worth a second look from internet researchers. Notably, the Levi Strauss company recently came out in favor of destroying the Second Amendment by pushing gun control. What’s especially interesting is that Virginia Hubbell Associates was paid $341,375 in just one year for “foundation management” services, according to this form 990-PF for 2015. If you’re noticing a lot of “Kimpton” names in this list, that’s probably because one of the primary sources of income for the Mental Insight Foundation is the Kimpton Hotel Group, LLC, which generated $2.3 million in revenue for the foundation in 2015. There’s nothing illegal about that. It’s just an interesting note. More research under way… check back for more stories each morning and evening. “In many cases she admits that the text messages mean exactly what they say as opposed to Agent Strzok, who thinks we’ve all misinterpreted his own words on any message that might be negative,” said Ratcliffe, who is a member of the House Judiciary Committee. Department of Justice Inspector General Michael Horowitz’s report released last month concerning the Hillary Clinton email investigation found Strzok’s anti-Trump texts with his then-mistress Page “deeply” troubling. Strzok testified before the combined House Oversight and Judiciary committees last week that he did not remember writing the text, but he meant the “American people” would stop Trump by not voting for him. “What I can tell you is that text in no way suggested that I or the FBI would take any action to influence the candidacy,” Strzok stated. “Andy” apparently referred to then-Deputy FBI Director Andrew McCabe, who stepped down from the position in January to go on administrative leave. He was fired in March, two days before he was due to retire. Then-Deputy FBI Director Andrew McCabe tasked the mistress of lead agent Peter Strzok to stay apprised of the probe into Hillary Clinton’s private server — a decision that other bureau officials took issue with at the time, according to the Department of Justice Inspector General’s bombshell report. McCabe was supposed to be insulated from the probe by two levels of management: Strzok worked for counterintelligence head Bill Priestap, who worked for national security head Michael Steinbach, who reported up to McCabe. However, Strzok communicated about the probe with his mistress, Lisa Page, who worked directly for McCabe and acted as a liaison for the Clinton investigation for the deputy director. Lisa Page, who was Special Counsel to McCabe, became involved in the Midyear investigation after McCabe became the Deputy Director in February 2016. Page told the OIG that part of her function was to serve as a liaison between the Midyear team and McCabe. Page acknowledged that her role upset senior FBI officials, but told the OIG that McCabe relied on her to ensure that he had the information he needed to make decisions, without it being filtered through multiple layers of management. Several witnesses told the OIG that Page circumvented the official chain of command, and that Strzok communicated important Midyear case information to her, and thus to McCabe, without Priestap’s or Steinbach’s knowledge. McCabe said that he was aware of complaints about Page, and that he valued her ability to “spot issues” and bring them to his attention when others did not. McCabe has been the subject of concerns about political bias in the FBI’s handling of the case because of his family’s ties to the Clintons. Around the time of the investigation, McCabe’s wife received $700,000 from Terry McAuliffe, a close friend of the Clintons who ran Hillary Clinton’s 2008 presidential campaign. The money was for McCabe’s wife to run for state senate, an unusual amount of money for that office. The IG report makes clear that McCabe intentionally essentially used Page as a mole to bypass multiple subordinates to feed him information about the probe. 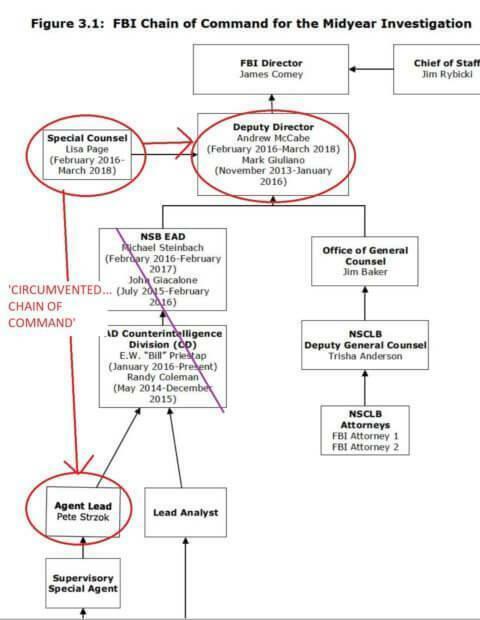 It also contains an organizational chart detailing the chain of command on the Clinton emails investigation, annotated by The Daily Caller News Foundation here to highlight the way in which Page’s role was to be McCabe’s eyes and ears instead of relying on the normal channels. The two exchanged tens of thousands of texts about the matter. It is unclear why it was so important to McCabe that information about the Clinton probe not be “filtered through multiple layers of management,” the IG report said, but officials may have believed that it would be inappropriate or abnormal to share certain information with him. The IG report said numerous people in the FBI were telling McCabe to recuse himself from the Clinton probe due to the appearance of conflict. McCabe resisted recusal and got into an “argument” and tense conversations with FBI officials. FBI General Counsel James Baker “had a series of conversations with McCabe culminating in a ‘very intense’ conversation in which Baker told McCabe that he believed he needed to recuse himself and that it was better that he do it ‘than have the boss order him to do it.’ He said McCabe ‘was not happy about it’ and ‘had lots of questions’ and they had a ‘good argument back and forth,’” the report said. Then-FBI Director James Comey said in the report that he would have taken McCabe off the investigation sooner had he known about the donations to McCabe’s wife. McCabe has not addressed whether he knew that Page and Strzok were having an affair and whether that is why Page had such a knack to “spot issues” in the Clinton probe. McCabe was fired in March 2018 for displayed what the IG called a “lack of candor” during interviews about his authorization of an FBI official to speak with The Wall Street Journal in October 2016 about the Clinton email investigation and is currently suing the government. Call it cosmic payback or reaping what you sow — either way, life has a way of swinging back like a boomerang and hitting people with a strong dose of reality. That’s what former FBI Deputy Director Andrew McCabe just found out, but he seems oblivious to the irony. The bureau figure who was fired for leaking to the press is now complaining about how unfair it is that there are leaks from the FBI, at the same time as he’s demanding immunity in exchange for his testimony to the Senate committee investigating the bureau’s handling of the Hillary Clinton email investigation. McCabe is one of the figures in the middle of several political bias scandals at the FBI, including the discredited “Trump dossier” and apparent spying by the FBI against Donald Trump’s presidential campaign. Back in March, the second-in-command at the FBI was fired by Attorney General Jeff Sessions. The reason was simple: McCabe repeatedly leaked sensitive information to the media and then lied about it. A report from the Department of Justice’s inspector general explained that McCabe was funneling details about a Clinton Foundation investigation to The Wall Street Journal, and was then dishonest about where the leak had come from… namely, himself. “The report states that McCabe authorized another FBI agent to leak information about an ongoing investigation into (the) Clinton Foundation to The Wall Street Journal, not in the interest of the public, but for his own personal gain,” summarized The Federalist. That official report goes on to explain in detail how McCabe “lacked candor” — bureaucrat-speak for “lied” — about leaks at least three times, including under oath. Now, showing just how tone-deaf the former bureau official truly is, McCabe is complaining about leaks from the FBI… yes, the same organization where he was fired for leaking like a sieve. In a letter sent to the Senate Judiciary Committee by McCabe’s attorney on his behalf, the disgraced former FBI deputy director essentially whined to lawmakers and declared that he was “outraged” that leaks about a criminal investigation of his alleged wrongdoings were taking place. “(A)s the result of a stream of leaks from the Department of Justice, it is now well-known that the (Office of Inspector General) has made a criminal referral to the United States Attorney’s Office for the District of Columbia,” the former deputy complained through his attorney. “As you know, the grounds for such a referral is the very low standard of ‘reasonable grounds to believe there has been a violation of Federal criminal law,'” the letter continued, bizarrely implying that reasonable suspicion of a federal crime was a bad reason to investigate someone. “Even so […] these leaks have forced us to acknowledge the criminal referral,” the letter admitted. The complaining and finger-pointing over the same type of leaking that McCabe was fired for doing didn’t stop there. “And, unfortunately, the stream of leaks has continued: As recently as last Thursday, additional leaks led to the reporting of specific investigative steps allegedly taken by the United States Attorney’s Office in response to the referral,” the document stated. “We are outraged by these leaks and last Friday requested an investigation by the Department of Justice’s Office of Professional Responsibility into the source(s) of the leaks,” McCabe’s attorney explained. That’s right: Apparently, leaking information to the media and then lying about it is completely fine when it can damage Donald Trump, but McCabe is suddenly “outraged” when similar leaks start actually hurting him. Maybe he’s just upset that he’s not the only snitch in town. Incredibly, the former deputy director then demanded immunity from prosecution in order to testify to Congress about matters related to the crimes — leaking and lying — that he’s accused of committing. “Mr. McCabe is willing to testify, but because of the criminal referral, he must be afforded suitable legal protection,” the letter declared. “Accordingly, we hereby request that the Judiciary Committee authorize a grant of use immunity to Mr. McCabe,” it stated. If there was still any doubt about why cronies like James Comey and Andrew McCabe needed to go, this should clear it up. They see themselves as special and above the law, and can’t seem to even comprehend that their own actions — and the culture of leaking that they created — have consequences. Inspector General Michael Horowitz’s report about the Justice Department and FBI’s 2016 investigation into Hillary Clinton’s use of a private email server is expected to be made public in the coming weeks, and one source told ABC News the draft of the report uses the word “insubordinate” to describe former FBI Director James Comey’s behavior. “The draft of Horowitz’s wide-ranging report specifically called out Comey for ignoring objections from the Justice Department when he disclosed in a letter to Congress just days before the 2016 presidential election that FBI agents had reopened the Clinton probe, according to sources,” ABC reported. Horowitz’s draft report was also critical of Comey for failing to consult with Attorney General Loretta Lynch and other senior Justice Department officials before making his July 5, 2016 announcement on national TV in which he said said that while there was no “clear evidence” that Clinton “intended to violate” the law, the former secretary of state was “extremely careless” in her “handling of very sensitive, highlyclassified informaion." Horowitz also criticized former Attorney General Loretta Lynch in the draft report for her handling of the federal investigation into Clinton’s personal email server, the sources told ABC News. The draft of the report was finished last month. Horowitz said the Justice Department and FBI will be permitted to submit a formal response that will be attached to the final report. On Tuesday, President Donald Trump went on Twitter to complain about the delay in the report’s release. The report has been widely expected to be critical of Comey. The only question is just how damaging the report would be of the former FBI director. “It’s not going to be good, it’s just a question of how bad it’s going to be,” a former Justice Department official told CNN last month of what’s expected to be in Horowitz’s report. CNN law enforcement analyst James Gagliano said sources tell him to expect “a damning indictment” of Comey and the FBI’s upper echelon. According to The Wall Street Journal, the report is also expected to scrutinize whether former FBI Director Andrew McCabe should have recused himself from the Clinton investigation, since his wife’s campaign for the Virginia legislature was aided by then-Gov. Terry McAuliffe, a Clinton ally. The report is also likely to criticize the thousands of texts exchanged by two FBI employees — agent Peter Strzok and attorney Lisa Page — who were extremely critical of President Donald Trump and others, the WSJ reported. The report is currently being reviewed and is expected to be released this month. Rudy Giuliani, one of the president’s lawyers, told the Associated Press in recent days that he believed the report would be damaging to Comey’s reputation. Being subpoenaed to appear in front of a judge is something most people want to actively avoid, but a report regarding the Obama-era FBI suggests dozens of agents want to have their day in court to expose government corruption. During Sean Hannity’s Fox News program Friday, the conservative host said he has learned that more than two dozen FBI agents want to be subpoenaed in order to testify about widespread abuses and political bias that occurred at the bureau during the Hillary Clinton email scandal. “We have an (Inspector General) report coming out, and I’m told as many as 28 people that have knowledge of the Clinton email server scandal want to be subpoenaed so they can tell the story of corruption at the highest levels of the bureau at that they love,” Hannity said. It appears that Hannity isn’t the only one who sees a major rift between top-level FBI figures, like former Director James Comey, and the hardworking agents who want to see justice served. Sara Carter, an investigative journalist whose reporting on Comey, the FBI and Clinton scandals has been proven correct with shocking accuracy, agreed with the Fox host. You have a right to cooperate with Congressional inquiries, just as you have a right to cooperate with the Inspector General. Anyone who tells you otherwise is lying,” Grassley added. By subpoenaing FBI members who have direct knowledge of corruption and political games within the bureau, lawmakers could give the good people who are still with the agency the protection they need to expose the truth. An FBI agent who allegedly quit the bureau over his belief that the Hillary Clinton email investigation was rigged will testify before the House of Representatives, The Hill reported. The joint investigation between the House Judiciary and the Oversight Committees — led by Republican Reps. Bob Goodlatte of Virginia and Trey Gowdy of South Carolina, respectively — has been a source of consternation for Republicans and Democrats alike. Conservatives have complained about the slow pace of the examination into how the Clinton email investigation was conducted, noting that only two witnesses have appeared before it. Democrats, of course, have complained that it exists at all, since anything that distracts from the endless investigation into how President Donald Trump is really a Russian plant is simply frivolous — particularly if it implicates former FBI Director James Comey, former Secretary of State Hillary Clinton or former President Barack Obama in any wrongdoing. Well, now we’re finally about to see some fireworks. Three top witnesses are going to testify before lawmakers: John Giacalone, who was in charge of the Clinton investigation for the first seven months; Bill Priestap, assistant director of the FBI’s counterintelligence division; and Michael Steinbach, former head of the FBI’s national security division and the man who succeeded Giacalone. All three are of particular interest, especially since Priestap was the supervisor of FBI agent Peter Strzok, whose anti-Trump text messages have thrown the objectivity of the entire investigation into doubt. However, the real headliner here may be Giacalone. Shortly after then-FBI Director Comey announced he wouldn’t be pursuing charges against Hillary Clinton for the email server, Fox News pundit Judge Andrew Napolitano wrote a column in which he claimed Giacalone had quit the bureau because he believed the investigation was rigged. “Six months later, the senior FBI agent in charge of that investigation resigned from the case and retired from the FBI because he felt the case was going ‘sideways’; that’s law enforcement jargon for ‘nowhere by design,'” Napolitano wrote. “The reason for the ‘sideways’ comment must have been Giacalone’s realization that DOJ and FBI senior management had decided that the investigation would not work in tandem with a federal grand jury. That is nearly fatal to any government criminal case. In criminal cases, the FBI and the DOJ cannot issue subpoenas for testimony or for tangible things; only grand juries can,” Napolitano continued. Either way, if the investigation had indeed gone “sideways,” it would need to have done so with approval from the highest levels — certainly James Comey and possibly Barack Obama. Whether or not Giacalone has any concrete evidence of this or not is another issue entirely. My guess would be no, given that we’re going on two years since Comey’s infamous news conference and we still haven’t heard anything to that effect from Giacalone. However, of all of the congressional testimonies we’ve seen over the past few years, this could be one of the most underreported. John Giacalone may open up a gigantic can of worms for Comey and Clinton — one that drags them back in the spotlight for reasons significantly less pleasant than their book tours.